This is looking out the side door. 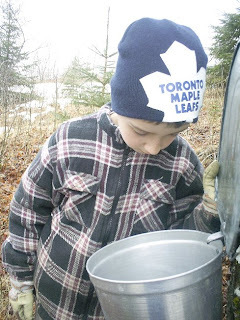 My little sweetie is checking for sap. Sap looks like water really. 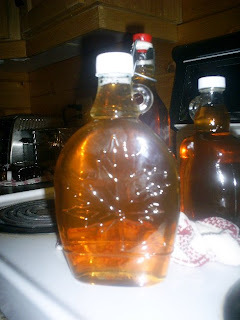 :o) It takes 40 gallons of sap to make 1 gallon of syrup !!! 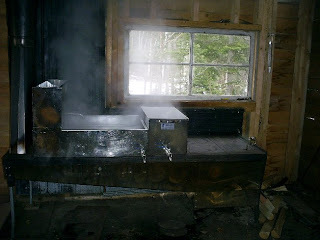 This is the stove my Big Sweetie boils the sap on. There are 3 pans in all. The first pan sits on the the second pan which sits directly on the stove. The third pan also sits directly on the stove. 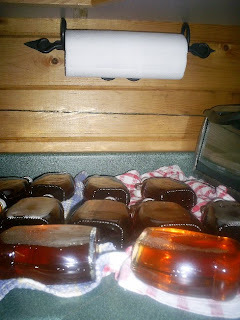 This is what the sap looks like in the the first pan. On the right you can see a blue valve. 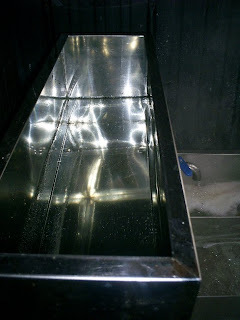 It is turned on slightly to allow the sap to trickle into the second pan. This is what the inside of the second pan looks like. It is divided into 3 chambers. It trickles in to the first chamber and then passes into chamber 2 and onto chamber 3. I didn't get it in the picture, but there is a valve on front of the pan. It would be the bottom right corner of the picture. 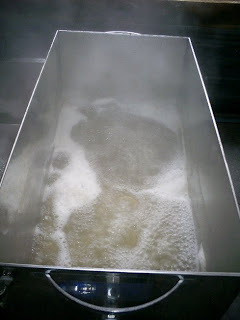 When it is boiling good in the second pan, the valve is opened and the sap is transferred to the third pan. It continues to boil in the third pan for a while. 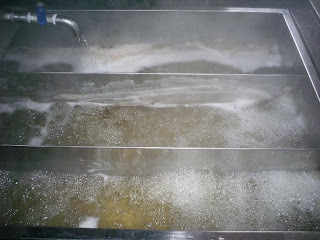 The temperature and sap levels have to be watched, so it doesn't boil dry or burn. 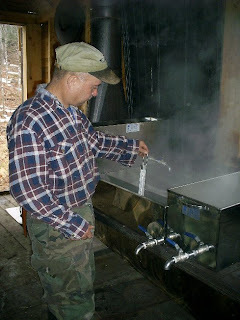 And the sap has to reach a certain temperature. My Big Sweetie finishes off the boiling in the house. It's more convenient since all the bottles need to be sterilized. Then he pours it in the bottles and they seal themselves. They'll cool on their side over night. Posted by Lisa at 10:46 p.m. Thanks for sharing! Have a very blessed Sabbath! March 30, 2007 at 3:31 p.m. 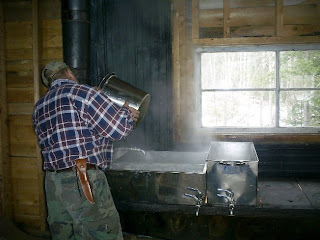 Maple syrup making is quite popular here in Canada. My husband just does it as a hobby, but there are some people who run it as a business. 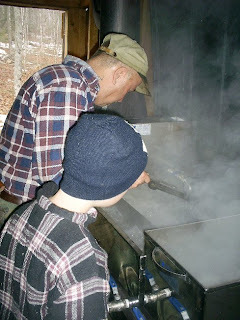 Alot of places have it open to the public to visit and make maple candy (I think that is what it's called). My husband has already given away 6 of his 15 bottles. He likes to share it and keep just enough to do us. :o) It is seeled so it will keep well all in a cool place for several months. 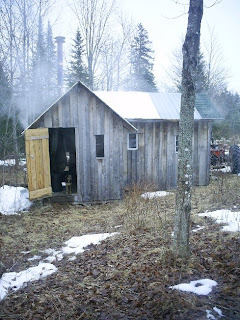 March 30, 2007 at 5:38 p.m.
Lisa, thank you so much for sharing the maple syrup process with us. I can't wait to share it with my beloved and the children. I didn't realize how much work went into making it. 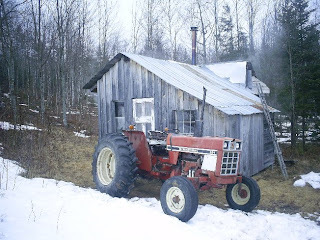 That's so neat that your beloved made the little shack to work in. Does your son get involved every time your beloved makes it? Is it only during a certain time of year that he can make it? Sorry for all the questions, I just find it all so very interesting. 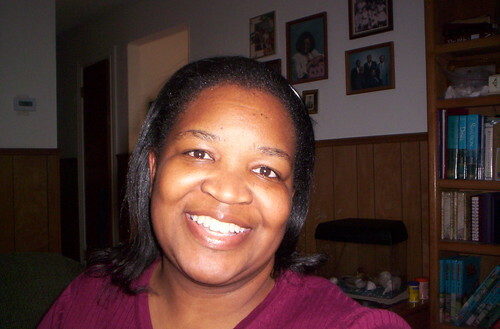 March 31, 2007 at 9:45 p.m.
What a great post! Alas, no sugar maples in humid East Texas, so I'll just enjoy your pictures. If I ever lived in a place where I could tap the trees, I think I'd give it a try. April 2, 2007 at 9:41 p.m.
Shereen - Making maple syrup is such fun. I wish I could share it with all of my blog friends. :o) I will write another post and answer your questions there just in case anyone else was wondering about those same things. Ann - I would go for humid right now. lol ;o) We had snow yesterday and it is sticking around a bit. The sap is still running, so that is good. April 3, 2007 at 11:08 p.m.